How can you become a super cool birder? The short answer, of course, is you can’t. I mean have you seen what we wear? Some of us try by sporting one earring; do we look like a super-cool dude or a prat? You’ve guessed it. My left ear sports a parrot dangling from a ring – have noticed a similar trend among well-known birders – are we even trying to look halfway normal? I don’t think so! One of the questions for the ‘Just a Linnet’ panel I was on at the 2007 BBF was ‘why doesn’t Kate Humble come to the Bird Fair’? Derrr! Have you seen Kate, all legs and ‘Orphan Annie’ eyes, does she look like a birder, I think not! She is a TV presenter so must be pretending to like birding to earn a crust. Look at her fellow nature show presenters… which ones are birders and which actors. I’ll give you a clue, the quiet, tall dark and handsome ones can’t tell a fly-catcher from a fulmar; the short, fat, hairy loquacious nutters are birders! Freeze a birder in a block of ice and tow him to Antarctica and he wouldn’t be cool. Birding is in the blood just like e-coli is in the bowels, so the outward manifestation of birding is not dissimilar; we look as if we have been vomited forth from a charity shop. Clothing co-ordination to us means wearing an anorak that is the same colour as our binoculars. The winner of the Best Dressed Man at the Bird fair 2007 was wearing camouflage from head to toe, two pairs of bins and a scope… the only accessories were a redundant compass and a Swiss Army knife dangling from some webbing. The interview he gave to the local TV station was so articulate they dropped the item in favour of a piece on Polish Plumbers. I’ll tell you how cool we are, we are so cool that the local TV station waited until everyone had left the Bird fair before doing their piece to camera in an empty marquee because they didn’t want any of our super-coolness to rub off! Is a birder wearing shades cool? Of course not! He’s only got them on as he drank 7 pints of Old Speckled Hen last night and this morning he can’t even remember his own name! Does wearing a green hijab make a birder look cool like the film stars and sportsmen who wear them? No! It makes us look even more shifty and dangerous like an Islamic fundamentalist checking cars at an Afghan roadblock. The latter looks dangerous because of his radical politics; the birder looks dangerous because he appears to have just burrowed under the wire from a secure mental health facility. What can you wear around your neck to look cool? A simple coral choker might do it, or maybe a single gold religious symbol or even a tattoo of your child’s name if it is named after a capital city. Would a pair of 8×30 Swaro’s cut it? I think not. This is particularly sad as most birders spend inordinate amounts of dosh at the Swarovski, Zeiss, Leica, Kowa or Opticron etc. stands firmly believing that the ownership of a pair of binoculars costing around £1,000 will make them look right-on fellows. Wrong! If you want to look cool and buy Swarovski then stick to the crystal! 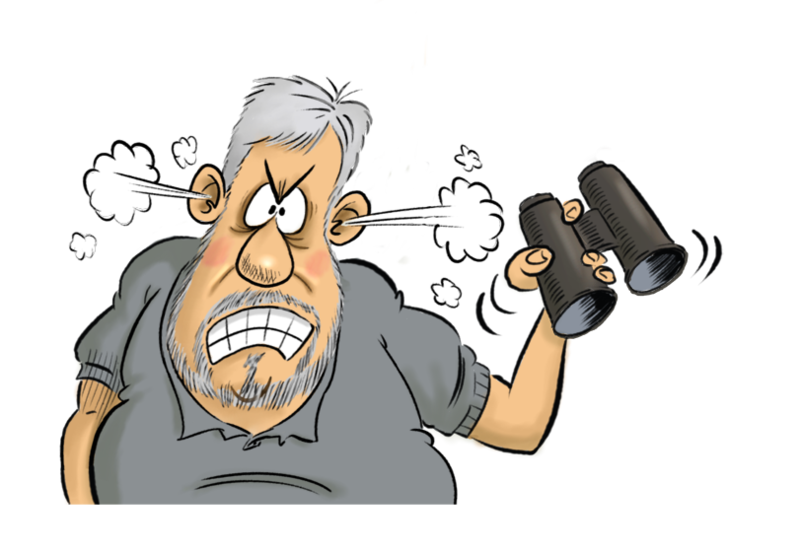 Even other birders don’t think you look cool when you spend an inheritance on optics as they all did that too! How about music… does dangling an iPod from your ears grant you membership of the right posse? No dummy! Even the most naïve of observers realise that you are not listening to the latest rap track or iTune but that you have created your own MP3s to learn the subtle differences between Blackcap and Garden Warbler songs. They know you are not bopping to the groove of a hip jive combo so don’t even bother to try and keep time with the rhythm because you will still look as cool as a drunken uncle at shotgun wedding. How about trying a trendy walk like a super-cool Caribbean; that strut with slightly nodding head acknowledging that you are God’s gift to womenfolk, or like the Asians who sashay with a sideways move of the head while driving one-handed up a Himalayan pass or walking across a Bollywood film-set. Starlets swing their booties and up and coming trendsetters pace with one finger coiled into their jacket loop as it hangs across their back. Can the birder manage a suave saunter? Nah. The best he can manage is a hobbled trot trying to get to a twitch before a rarity flies off, or a stagger not a swagger, when carrying binoculars, telescope, backpack, fieldguide, waterproofs, sipping bottle and lunch! There is just one way to be a cool birder… sea-watch in November with a gale force wind from Siberia pinning you against a north-facing seawall – and for cool read cryogenically preserved!